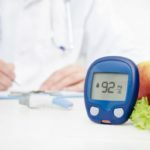 A randomized trial shows sizable reduction in fasting plasma glucose, serum insulin levels, and HOMA-IR. Women with gestational diabetes who adhered to a healthy diet had a 20% lower chance of developing hypertension. A diabetes prevention program-derived lifestyle intervention benefits women with gestational diabetes. Outcomes with diagnosis before 12 weeks gestation are similar to those with preexisting diabetes. Higher levels of fat are linked to a higher risk for developing diabetes at 24 to 28 weeks of pregnancy. Culturally specific strategies are necessary to prevent and managed gestational diabetes and subsequent risk for developing type 2 diabetes. For infants, glyburide was associated with more respiratory distress and admission to neonatal intensive care compared with insulin.